When this whole support forum migration is done, it'd be wonderful if we think about allowing each Rosetta site to change the bbPress slugs to reflect the locale being used. I don't think we should allow this. Having the same slug on all sites makes it's easier to switch from one site to another because we only have to change the subdomain. Having the same slug on all sites makes it's easier to switch from one site to another because we only have to change the subdomain. I don't see that as something relevant. Who is the "we" in that sentence? 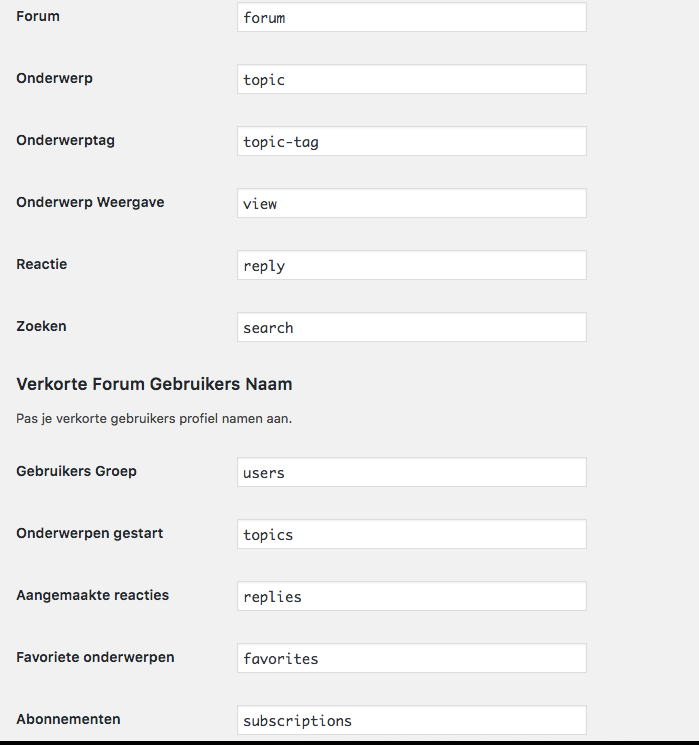 The forum and topic slug URLs can be localised as part of bbPress, e.g. This is under discussion in ​#bbpress2976. It's discussed over there for new installations, but that's not what this ticket is about. This proposal is for the Rosetta support sites after the migration is done. IMHO warenting to keep this ticket open. I've looked at the existing "parent" blog at ​https://nl.wordpress.org/ and found the following behavior. I'm not sure that WordPress core has a set behavior around translating slugs, so I'm reopening this ticket. Just to confirm, I did not touch any of the settings. Unless there's a compelling reason to do this I think we need to close it as wontfix.